Gallia Academy junior Blaine Carter (11) defends a Jackson player during the first half of Saturday night’s non-conference boys basketball contest in Centenary, Ohio. Gallia Academy senior Justin Peck (35) releases a shot attempt over a pair of Jackson defenders during the second half of Saturday night’s non-conference boys basketball contest in Centenary, Ohio. CENTENARY, Ohio — Ultimately, the Blue Devils just kept pecking away inside. 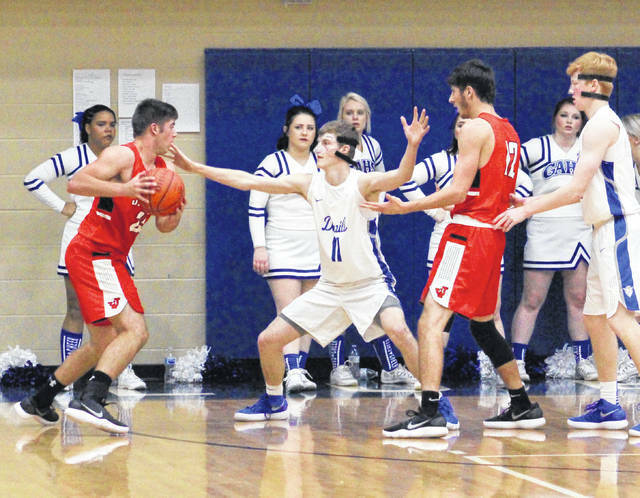 Senior Justin Peck scored 20 of his game-high 24 points during a 39-25 second half surge Saturday night that allowed Gallia Academy to remain unbeaten following a 61-48 victory over visiting Jackson in a non-conference boys basketball contest in Gallia County. Peck made an immediate impact in his first game of the season, as the 6-foot-5 post player helped the host Blue Devils (3-0) overcome a small halftime deficit with an inside presence that the Ironmen (3-1) simply couldn’t match. 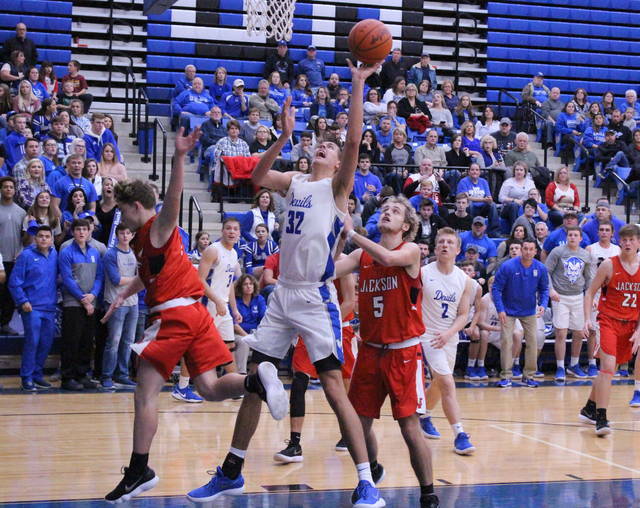 With Jackson’s primary focus being on 7-foot sophomore Zach Loveday, the Blue and White turned their offensive focus to Peck — who scored 10 points apiece in both the third and fourth frames. 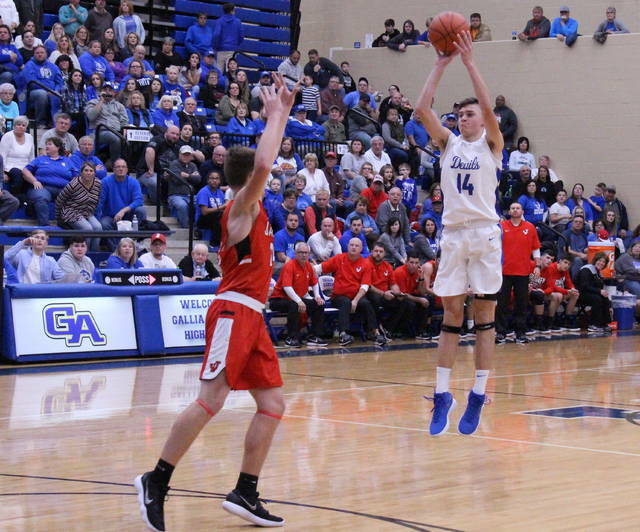 Gallia Academy ended up making its final eight shot attempts of regulation and connected on 65 percent (17-of-26) of its field goal tries after halftime, all while leading the final 14:24 of the contest. The Blue Devils — who trailed 23-22 at the intermission — received 40 points from their dynamic duo of Peck and Loveday, with 27 of those coming over the final 16 minutes of play. The hosts were also a perfect 7-of-7 from the floor during the fourth quarter, while JHS made just 8-of-27 shot attempts after halftime. Following the spirited triumph, GAHS coach Gary Harrison acknowledged that Peck played a big role in the final outcome. The fifth-year mentor, however, also noted that the senior big man wasn’t the only person deserving of kudos in this emotional win. “Justin came in and gave us some energy after halftime. Jackson didn’t have anyone that could match up with him inside, and we are fortunate to be able to move Zach to the high post and play the inside-out game. It’s going to be hard for anyone in southeast Ohio to stop that,” Harrison said. “The main thing with Justin tonight is that it wasn’t just his offense, but it was also his defense … because he just didn’t give up anything inside. He was just possessed tonight. The Red and White built a trio of four-point leads in the opening period, the last of which came at 12-8 following a Carson Spohn free throw with 3:25 left. 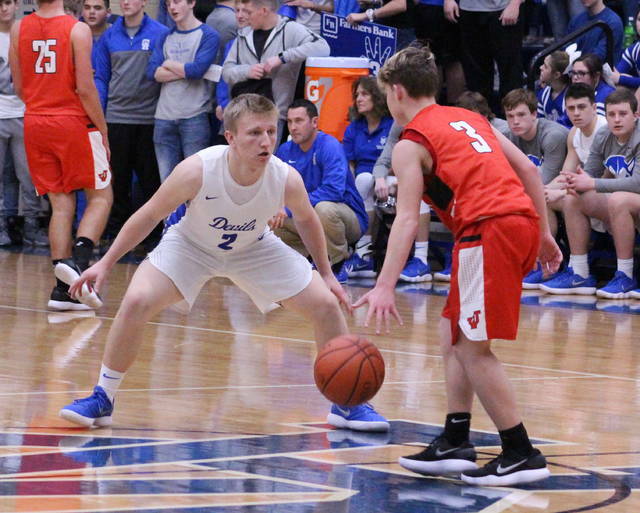 The Blue Devils held JHS scoreless the rest of the way and made a 5-0 run over the final 2:38, giving the hosts their first lead of the night with a 13-12 edge through eight minutes of action. There were two ties and eight lead changes in the second stanza, and neither squad led by more than two points during that span. Caleb Wallis sank two free throws with 7.9 second left in the half, allowing the guests to take a slim 23-22 cushion into the intermission. The Ironmen shot 35 percent (7-of-20) from the field in the opening half and committed only two turnovers, while the hosts were 8-of-26 from the floor (31 percent) and had three miscues. 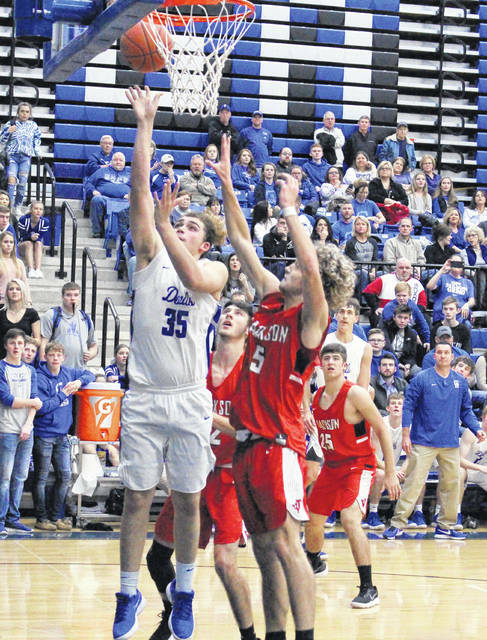 Peck scored only four points in the first half — all in the second period — after coming off the bench late in the opening canto, but the Blue Devils looked for the big man early and often out of the break. The senior scored the opening basket of the second half, but Cooper Donaldson answered for Jackson with a pair of free throws at the 6:36 mark — allowing the guests to take their final lead of the night at 25-24. Peck responded with another basket just a dozen seconds later for a permanent lead, then Evan Wiseman followed with a pair of free throws at the 5:31 mark for a 28-25 edge. JHS made a small 4-2 run to close back to within a point (30-29) with 4:46 left, but Peck answered with consecutive buckets while sparking a 15-6 charge over the final 3:57 — giving the Blue and White their first double-digit lead of the game at 45-35. The Red and White never managed to trim that lead back down to single digits as GAHS made a 14-7 run to start the fourth, giving the hosts their largest advantage of the game at 59-42 with 2:39 left in regulation. Jackson whittled the lead down to 59-48 following a pair of free throws from Payton Speakman with 26 seconds remaining, but Peck added the final points of the night on a basket with 14 seconds left — wrapping up the 13-point triumph. Harrison was confident that his troops were in a good spot coming out of the break, mainly because of his squad’s depth and also because the Ironmen had played just 24 hours earlier at Greenfield McClain. He knew it wouldn’t be an easy task to put Jackson away, but his assumptions proved to be spot on by night’s end — something that should benefit his troops moving forward. “With Jackson playing the night before against Greenfield, I knew they were sucking a little wind at halftime. We knew we were going to make a run at the start of the third quarter because they were starting to look tired,” Harrison said. “Jackson didn’t necessarily come out flat after halftime, but I felt that we just really asserted ourselves and benefited from our deep bench. Gallia Academy outrebounded the guests by a 33-23 overall margin, including a 14-9 edge on the offensive glass. The hosts also committed eight of the 11 turnovers in the contest, with five of those miscues coming in the fourth quarter. The Blue Devils connected on 25-of-52 field goal attempts for 48 percent, including a 4-of-7 effort from three-point range for 57 percent. The hosts were also 7-of-11 at the free throw line for 64 percent. Peck had six rebounds to go along with his game-high 24 points, while Loveday added a double-double effort of 16 points and 11 rebounds to go along with four blocked shots. Wiseman was next with nine points and five boards, while Justin McClelland and Cory Call respectively added five and four markers to the winning cause. Caleb Henry and Logan Blouir rounded out the winning tally with two points and one point, respectively. Jackson netted 15-of-47 shot attempts for 32 percent, including a 3-of-18 effort from behind the arc for 17 percent. The guests were also 15-of-18 from the charity stripe for 83 percent. Donaldson paced the Ironmen with a double-double performance of 17 points and 10 rebounds, followed by Speakman with 11 points and Spohn with 10 markers. Wallis and Brice Graham were next with respective efforts of five and three points, while Taylon Davis and Caden Donaldson completed the scoring with one point apiece. Gallia Academy returns to action Tuesday when it travels to Pedro for its Ohio Valley Conference opener against Rock Hill at 6 p.m. The Blue Devils will also host Ironton next Friday in another pivotal OVC contest.